Every year, renowned photographer Freeman Patterson embarks on a journey of discovery and renewal to the desert of South West Africa. His photographs - spectral images of an abandoned mining town, sensual curves of a rippled sand dune, a vibrant orange slash of wildflowers blasting through a slab of granite - invariably evoke highly personal reactions from viewers. People understand immediately that what they are seeing is much more than a perfectly composed recording of a time and a place. It is an image that reaches out to touch and to stir the mind and the heart. Published in 1998, ODYSSEYS is a new Freeman Patterson collection of pictures and meditative reflections on life, created among the abandoned diamond mining towns in the desert of southern Namibia. Wandering among the hauntingly beautiful building, the forces of the desert now blown into every corner of a fleeting human presence, Patterson reflects upon his own reactions to these poignant symbols. Each observation acts as a catalyst to exploration and understanding. Perspective in nature and in relationships; the imprint of footsteps on sand and memory on mind; the explorer - and the child - within all of us: each of Freeman's essays is personal, yet universal, illuminating the truths of life that have inspired his work. 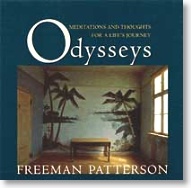 A book for all those embarking on their own spiritual or artistic journeys, ODYSSEYS is a fusion of eye and soul, another treat for Freeman Patterson fans, and a soon-to-be cherished gift title, both in its limited edition and its trade edition. "Multi-talented Freeman Patterson's latest collection of photos, taken in abandoned diamond-mining towns in Namibia, Africa, is sheer magic. The subtle shades of golden images of sand, walls and open doorways in ODYSSEYS pile up until they become an embarassment of riches in a setting of utter desolation, deterioration, and abandonment. It's like walking into a field of buried treasure, where, at every turn, you encounter scenes of such stunning beauty that they dazzle the senses and confound the mind. Contemplating their meaning could take a lifetime. The photos are so sensual that the viewer is profoundly affected by looking at them. Patterson's prose is as his photos. He's a man with vision and a keen eye for beauty. He quotes William Blake - "seeing the world in a grain of sand." One suspects perhaps the prescient Blake had Patterson in mind when he wrote that."